Lamb chops are usually prepared by grilling or sautéing them over high-heat. 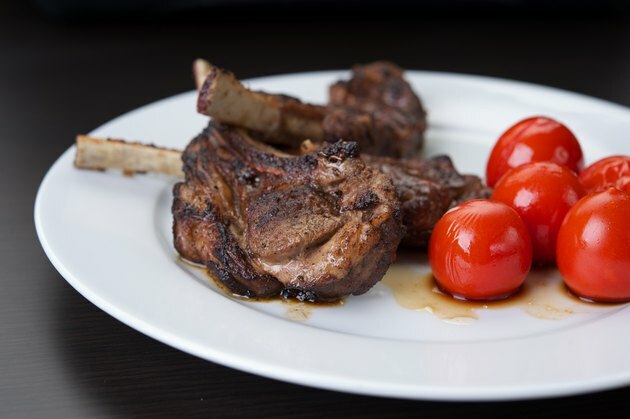 If you want to bake lamb chops, you need to choose tender cuts that will cook well in the oven. Purchase a minimum of one chop per person and serve the baked chops with vegetable and potato side dishes. At a minimum, you should purchase lamb chops that are about ¾ in. thick. If you buy smaller chops, you'll find that they can become easily overcooked. Large cuts of meat will make it more likely that you dry out the meat while roasting while the center remains rare. Choose chops with pink meat that feels firm to the touch. The bones should look moist and have a reddish color. Loin chops are lean and expensive cuts of meat that are best cooked over high-heat on the stove or grill. Sirloin chops are cheaper and tougher cuts of lamb that are typically broiled or grilled. If you want to roast the chops in the oven, a rack of lamb is recommended by "Bon Appetit" magazine. The rack can be divided into rib chops and roasting the meat can help deliver a tender and flavorful dish. Instead of roasting lamb chops in the oven throughout cooking, consider searing the meat on high-heat first. You can use a small amount of oil and a large skillet to sear the lamp chops for about three minutes on each side. The skin of the chops should be browned before removing from the heat. Cover the lamb chops in a roasting dish after browning, and cook in a 400 degree Fahrenheit oven for 10 to 15 minutes depending on how well-done you want the meat. If you want lamb chops medium-rare, the internal temperature on the meat thermometer should register 140 degrees Fahrenheit. The interior of the meat will still be pink. For medium, the interior will only be slightly pink and the internal temperature will measure 155 degrees Fahrenheit. Well-done chops will have an internal temperature of 165 degrees Fahrenheit and have a brown or gray color throughout the meat.